The anti-cult movement is a loose collection of individuals and organizations who are involved in attacking alternative spiritual teachers, small religious movements or groups, and support those who are against non-mainstream religions. Since I’ve been attacked by these people myself I should let you know something about them and what they stand for. On the surface that movement appears to care about the welfare of others. They use words like support, victim, protect, care and family, and use convincing terminology. They place themselves apparently at the center of society’s moral good and generally find support amongst the media and some politicians. But in my view, far from being concerned with the welfare of others, they are persecutors who are a shelter to and facilitator of bullies and anonymous lawbreaking internet trolls, and they promote the kind of propaganda that instils religious bigotry and intolerance within a society. Who likes a cult or a cult leader? The media has created such a bogey man effect that the word ‘cult’ has now become a bigoted word that can be used to effectively strip away a person’s rights and humanity, in a similar way that the ‘n’ word did to black people in the USA years ago, and the word ‘heretic’, ‘witch’ and ‘blasphemer’ did throughout history. It’s the same method that has been used by propagandists time and again to mobilize society to suppress various groups of people, inciting bigots, bullies and ill-informed people to do the dirty work. But look a bit deeper at what’s attacking people around the world who are practicing alternative spirituality and you’ll find a movement that is harmful to society. The anti-cult movement often works hand in hand with established religions and is used by religious fanatics and haters of alternative spirituality to stamp out threats to established values. The cult criteria are carefully crafted by these anti-cult people using emotional words, put in such a way to presuppose the accused is in the wrong, and put together in such a way that no spiritual group can avoid them. 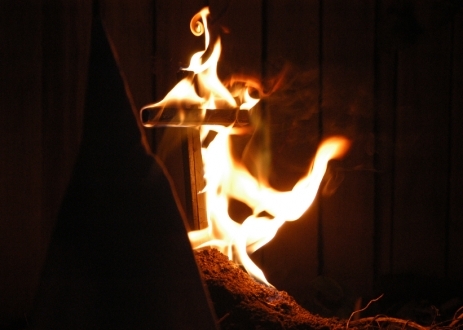 The word cult has the same psychological impression as witch and heretic had in their day, and powerful influences have spread its psychological impact throughout society, so much so that the branding of an individual with it immediately places them at the lowest level of society as a scourge to be gotten rid of. This is particularly effective when professionals can be brought in to give the impression that society stands against the accused. This is a modern day witch hunt, with the same missionary zeal displayed by those involved in it. People have been linked by association with harmful groups and individuals when they have nothing in common with them at all. This is completely unacceptable and would not be possible without false allegations being supported by the use of the word cult. The anti-cult movement uses the internet where it provides venues for its cause. Cyberbullies were able to make false and harmful statements about me because they could post anonymously on forums where the forum providers essentially have immunity from legal action. The forum providers wouldn’t remove the offensive content when asked to do so and didn’t even allow a response to be made in defence. No one can be held to account for their actions like this, not even by name, and this provides a safe haven for psychopaths to hurt people and get away with it. This is a dark side of the internet that should be closed down. Anti-cult forum providers or moderators readily take attackers false statements and publish them without checking their validity or checking the other side for a response. That people can do this and have the support of the media is a grave injustice. Some make money out of this; there are so called ‘experts’ in their field who can be paid to give credibility to attacker’s testimonies – these are traders in human misery. One group that took the head of an anti-cult forum to court had to give up the case because they ran out of money. 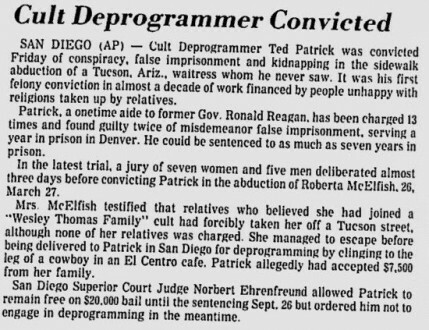 The anti-cult head on the other hand had access to lawyers who would work for free, who were supportive of his cause. Justice is priced way beyond the reach of an ordinary person, in a legal system that serves the wealthy but effectively excludes the majority. Not only that, but simply being labelled with the word ‘cult’ can put someone in a disadvantaged position as many judges simply believe the anti-cult propaganda and negative associations the word ‘cult’ has. These loopholes in the law need to be closed. The anti-cult movement is putting a stranglehold upon what is allowed spiritually and what is not. And those tightening that hold are people with their own agenda, bigoted and intolerant individuals and organizations that want to stamp out the freedom to choose one’s own spirituality. But they are not wholly immune to the law, and it must be shown where they are breaking the law or are abusing it, or are facilitating others to break it. I believe that the methods the movement uses constitute a terrible system of injustice, one that prevents personal and spiritual freedom and brutally oppresses and abuses those who it wishes to ruin. It deserves to be brought to public attention so that something can be done to stop it, and that those who suffer its burden can understand what is happening to them. Religious intolerance and suppression have existed everywhere. In modern western societies laws have been crafted to stop spiritual oppression, but loopholes have been found that circumvent these laws, such as the extortionate cost of defamation cases. People who have been defamed by the anti-cult movement are left facing insurmountable legal costs to get statements that put their lives in danger retracted. Justice only for the wealthy is not justice and neither is an immunity from liability as third party service providers. These loopholes in the legal system are something the anti-cult movement benefits from. I believe they are heralding a return to medieval values that have no place in the modern era. The effect of this insidious movement is to extinguish and dumb down alternative spirituality, removing the ability of people to gather in small groups and practice spiritual or esoteric knowledge. It is driving individuals attacked by it to ruin in body and mind. Its methods are both cunning and brutal. The Anti-Cult Movement’s campaign of hatred has got away with so much appalling activity, which normally wouldn’t be allowed in society, by the use of the word cult, and by exploiting loopholes that exist in the law. There are individuals in spiritual groups who do commit crimes, but there are existing channels that people can use to report wrong doing – there is no place for anti-cult groups in society. They sow misery, injustice and spread inflammatory ideas about people, destroying lives. Many thanks to the people who show the love and care to oppose attacks and to stand up for the truth. This is an extremely serious issue – we are struggling for the right to practice the spirituality of our choice, and to be able to live normally in society without being persecuted or harassed. It’s not enough to bury your head in the sand and think it won’t happen to you. If you’re practicing alternative spirituality or are in a small religion, it only takes someone who doesn’t like you or your group to cry ‘cult’ and the insidious mechanism of the anti-cult movement fuelled by media propaganda can fall against you and tear apart your life. Behind it are powerful people with agendas towards alternative spirituality. Don’t let them continue to erode your rights. As I’ve said, those people are not immune to the laws. I hope that people become educated on the laws that harassers, stalkers and bullies break and that people be empowered to use them in order to seek and obtain justice. I hope the laws can be changed to stop cyberbullying, defamation and harassment in simple, practical ways. And I hope that the propaganda methods of the anti-cult movement and all those who support the insidious agenda against alternative spiritual groups and movements are understood, and that people have access to information informed and educational material that allows lots of people so see through the abuse and hatred. And I believe that the injustices of the anti-cult movement and those they shelter should be exposed for all to see. 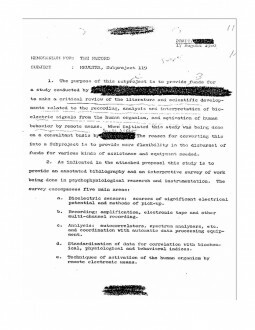 A declassified document from the illegal MK-ULTRA project. The ACM was supported and legitimized by civilian psychiatrists and psychologists linked to US government mind control research projects. This religious brainwashing theory served as a means to police thought and personal behavior by medicalizing commitment to non-mainstream spiritual ideals, postulating that the adoption of those beliefs was either pathological or induced through nefarious brainwashing methodology, not personal choice. As such, it attacked the foundation upon which human rights like the freedom of conscience and religion rest, arguing the adoption and expression of those rights should not be regarded as the product of an individual’s free will when the beliefs or practices an individual chose were condemned by external parties. As a corollary of this mindset, ACM proponents have at times advocated authoritarian laws that would effectively limit or wind back the freedom of conscience, religion and expression in relation to alternative spirituality ((Narovski, Justin. “The Anti-Cult Movement: History and Impact.” League Against Religious Intolerance. December 24, 2015. http://consciousreporter.com/the-anti-cult-movement-history-impact/.)) — freedoms which have long been enshrined in the laws and value systems of Western societies. ((Article 18. Universal Declaration of Human Rights: “Everyone has the right to freedom of thought, conscience and religion; this right includes freedom to change his religion or belief, and freedom, either alone or in community with others and in public or private, to manifest his religion or belief in teaching, practice, worship and observance.” http://www.un.org/en/universal-declaration-human-rights/)) This ideology has arguably influenced law-enforcement practice too, ((Possamaï & Lee. “New religious movements and the fear of crime” In the Journal of Contemporary Religion, pages 337-352. Volume 19, Issue 3, Routledge 2004)) most visibly at the WACO siege where a Christian commune was surrounded by a massive unconstitutional law enforcement deployment using military equipment (including tanks) whose personnel fired into the premises which later caught fire, with seventy-six people including women and children dying inside. On a more personal level, this ideology rationalized the notion that another individual’s rights to freedom of belief could be summarily suspended and opposed when “brainwashing” was deemed to have occurred, making forcible intervention and violation of their civil liberties arbitrarily justified. ((Anne Prichard. ACLU Report on Deprogramming and the Law. January 1978)) Thus the coercive and frequently violent and illegal practice of deprogramming was born. Throughout the 70s and 80s, private deprogrammers – who were often of dubious background and without relevant credentials – were hired by third parties (often disapproving family members) for exorbitant fees, to forcibly abduct and confine people against their will, to compel them to recant their beliefs. ((LeMoult, John E. “Deprogramming Members of Religious Sects.” Fordham Law Review 46, no. 4 (1978): 601.)) Deprogrammers sometimes took drugs during their sessions, and sometimes the kidnapped victims were deprived of sleep, personal privacy and food, threatened with violence, subjected to repeated psychological strain, and in extreme cases, beaten and even sexually assaulted. ((Shupe, A. D., & Darnell, S. E. (2006). Agents of discord: Deprogramming, pseudo-science, and the american anticult movement. New Brunswick, NJ: Transaction. pg 92-99)) Scholars observed that, through endorsing the practice of deprogramming, the ACM supported coercive tactics far more demonstrably than any groups they ironically accused of being coercive. In spite of the ACM’s lack of scientific rigor and standing, its ideology has been promulgated throughout society with the largely uncritical cooperation of the mainstream media, which has often utilized the ACM as an expedient source of sensational and alarmist stories about “cults,” ((Scholars Possamaï & Lee suggest that the anti-cult movement acts as a “repository of information for the public, the press, and governmental agencies” Possamaï & Lee. “New religious movements and the fear of crime” In the Journal of Contemporary Religion, pages 337-352. Volume 19, Issue 3, Routledge 2004)) and has largely supported ACM perspectives and narratives. ((James T. Richardson and Barend van Driel. “Journalists’ Attitudes toward New Religious Movements” In Review of Religious Research, Vol. 39, No. 2, Special Issue: Mass Media and Unconventional Religion (Dec., 1997), pp. 116-136)) ((Stuart Wright. “Media Coverage of Unconventional Religion: Any “Good News” for Minority Faiths?” In Review of Religious Research 39(2):101 · December 1997)) Studies have found that the media has been consistently biased against new religious movements, and often employs the loaded pejorative term “cult” to describe them in an overwhelmingly prejudiced way. ((A study by Nexus that analyzed the contents of more than 250 publications over a 22 year period found that there were 191,425 stories that used the pejorative term “cult,” compared to only 4,196 articles that utilized the term “new religion.” Witham, L. (n.d.). Manipulating the Media Against Small Religions. In M. J. Herbers (Ed. ), Thistles Among the Flowers.)) The ACM and the mainstream media have done much to conflate the once neutral word “cult” with the criminal actions of a minority of criminal groups, ((Sociologist Lonnie Griffin suggests that NRMs are only interesting to the press when they involve conflict, leading to only 1 percent of NRMs being represented in the mass media. Lonnie F. Griffin “An analysis of print media reporting of established religions and new religious movements” University of South Florida, 2004)) so that any group labelled a “cult” is linked with or suspected of criminal or dangerous behavior by tenuous association, and viewed with extreme prejudice, negativity, and paranoia. This has irrevocably altered the meaning and effect of the word “cult,” which was once a neutral, non-judgmental academic term used to refer to systems or practices of ritual or devotion (as in the reference to the historical “cult of Mithras” for example). Now the label “cult” is a powerful stigma, engendering the intolerant ideology of the ACM and the negative narratives instilled by the mainstream media; this has become so entrenched it functions as an unconscious prejudice in society ((“In the last thirty years, the word “cult,” today’s most common mass media moniker for new religions, has lost any descriptive, sociological meaning it may have once had. It now conjures images of brainwashing, coercion, deception, exploitation, perversion, and religious fraud. For many Americans these associations have become doxa – those socially constructed opinions, assumptions, and inclinations so taken for granted that they seem natural.” Sean McCloud. From Exotics to Brainwashers: Portraying New Religions in Mass Media. The University of North Carolina at Charlotte)) – the default schema by which alternative spiritual groups are perceived. One of the most pervasive ways the ACM has instilled these narratives is through the contrivance and circulation of atrocity stories or captivity narratives. There is a recurring pattern where a very small but vocal minority of ex-members of new religious movements, or apostates as they are termed in academia, become outspoken critics of their former organizations, and also become associated with the ACM after leaving. ((In some cases sociologists suggest that apostates who go on revenge campaigns against their previous affiliation seem to have been ‘coached and counseled by the “deprogramming” or “exit counseling” movement.’ See: Wright, Stuart, “Leaving Cults: The Dynamics of Defection” 1987 and Barker, Eileen, “Defection From the Unification Church: Some Statistics and Distinctions,” 1988)) Apostates who turn into professional critics of their former organizations are statistically marginal. Studies have found that most people who leave new religious movements report having a positive or neutral experience. ((“Report of the Swedish Government’s Commission on New Religious Movements (1998).” CESNUR. 1998. http://www.cesnur.org/testi/swedish.htm)) ((Bromley, D., and J. Hadden. The Handbook of Cults and Sects in America. Greenwich: JAI Press, 1993. 75-97.)) However the disgruntled minority are the most vocal, and are the ones who tend to be given a platform in the media. 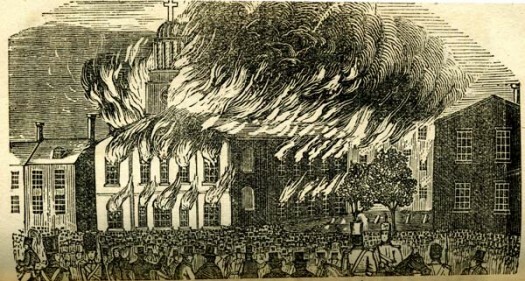 St. Augustine’s Church in Philadelphia, burned down by anti-catholic rioters in 1844. Sensational captivity narratives about catholic convents functioned as propaganda used to incite anti-catholic sentiment in the USA in the 19th century. Modern anti-cult captivity narratives are structured and utilized in a similar fashion. The media has focused almost exclusively and disproportionately on the negative stories of these ex members when presenting stories on unconventional movements, and often does so without calling their biases into question. The phenomenon of apostate testimony has been widely studied by social scientists, and much research has been done explaining why these testimonies tend to be inflated, biased, exaggerated, and unreliable. ((Wilson, Bryan, “The Social Dimensions of Sectarianism”, Rose of Sharon Press, 1981.)) ((Kliever, Lonnie: “The Reliability of Apostate Testimony About New Religious Movements”.)) ((See also Bromley, David A. (ed.) (1998). “Apostasy and the Management of Spoiled Identity” and Wright, Stuart A., “Exploring Factors that Shape the Apostate Role” in The Politics of Religious Apostasy, pp.185-186 and pp 95 -114, Praeger Publishers.)) When someone has a belief or identity for an extended period that is considered unconventional or eccentric in mainstream society, and then leaves and wishes to re-integrate with a mainstream lifestyle, there is often a motivation to explain away why they joined and have now left a lifestyle they committed to for a long time that “normal” people might view as strange. ((Wilson, Bryan. “Apostates and New Religious Movements”)) Atrocity stories and captivity narratives come into play, as they allow a person to absolve personal responsibility for their past actions and choices by claiming they did not willingly join an organization, but were compelled to remain in it through some nefarious process of “mind control” – an explanation willingly offered and supported by the ACM – that left them incapable of independent thought or personal choice. ((Kliever, Lonnie: “The Reliability of Apostate Testimony About New Religious Movements”.)) It has been suggested that such a narrative can enable an ex-member to be accepted more readily by outside parties. Apostates have been described by sociologist Max Scheler as those who after changing their convictions are “motivated by the struggle against the old belief,” who live “only for its negation” and who are engaged “in a continuous chain of acts of revenge against his own spiritual past.” ((Max Scheler, “Ressentiment”1961, pp. 66-7)) It has also been noted that apostasy is similar in this respect to the outcome of a rancorous divorce. ((Moojan Momen, “Marginality and Apostasy in the Bahá’í Community” In Religion, 37:3, pages 187-209, 2007 http://bahai-library.com/momen_marginality_apostasy)) In these circumstances, playing the role of the victim may enable an apostate to seek personal validation by lashing out, and justify their antagonism by presenting those they are attacking as wrongdoers, and their retribution as heroic. Thus the assumption of a victim identity can be used to rationalize or absolve personal responsibility for both past and present actions. By casting themselves as victims those who are antagonistic towards their previous affiliation are able to transfer personal grievances into social problems. Some apostates have made lucrative careers from publicly denouncing their former organizations in this manner. The internet has enabled ACM ideology and apostate testimony to be disseminated online independent of the mass media. The ACM facilitates the online proliferation of apostate testimony in a number of ways, foremost by providing the ideology and terminology through which ex-members can construct narratives to critique their former organizations. Apostates are known to create their own dedicated websites for this purpose. ((Jean-Francois Mayer, “Religious Movements and the Internet: The New Frontier of Cult controversies” In Religion on the Internet: Research Prospects and Promises, pp249-276 http://www.mayer.lt/resources/2000_MAYER_Religious_Movements_Internet.pdf)) However, some ACM websites go further, and facilitate this directly by providing web forums which function as safe havens for what could be argued is hate speech. In such venues, apostates and anyone with an axe to grind can attack groups anonymously without restraint. Sometimes, the minority of ex-members prone to this sort of retributive behavior, possess unbalanced dispositions, and may be in need of professional assistance. Instead of directing such people toward constructive and peaceful resolution options, the ACM radicalizes them, and these individuals then perform the dirty work of attacking spiritual minorities. Although the ACM positions itself as a defender of society’s values, its behavior cannot be objectively considered constructive in this context, as such behavior is inherently destructive in nature, potentially harmful to the groups which are attacked, as well as to the well-being of those encouraged to expend time and energy in attacking them.